Welcome to the portal of FANTASYWORLD 2.0 - the master homepage. This homepage, well, is for our members to request new areas to be added into the new game. -New Areas, Towns, and Maps to add into the world. Please provide a description of what the area/town is known for, what can be bought in this town, what kind of people live there, etc. It will be added to the world map. -New Races to be added into the game. Please add a description of their strengths/weaknesses! Thank you for your contribution to the new game! It is going to launch in May. The World Map will also be posted on this page. Feel free to ask any questions you have about the game here also! The staff will gladly answer. Our Servers are currently being worked on right now, but we assure you we will have them up and running soon. For now, we are asking our users to preorder the game. You can purchase it starting Tuesday, June 2nd, 2015. Welcome to version 2.0 of FANTASYWORLD Online, the game’s latest installment. This version contains advanced graphics as well as more customization options for your character. You will have to fill out the following items to verify your ID if you already have a FANTASYWORLD account. Your level, customization items, and any items obtained in the first version of the game will be carried over if you have played FANTASYWORLD already. You may select a new race and screenname if you like. If you are new to the game, just fill out this information below to get started! A new account will be made for you then. To help assist you in your character creation or reupload of data, here is some information about the character system of the FantasyWorld Online 2.0. Like any other MMO, this game has a fair share of races and classes to choose from. You also have the ability to customize your character with over 100,000,000,000,000 unique customization items. I will explain the race and class system. Each Race is allowed to have certain abilities, but you must also have weaknesses as strengths. You may also have a Class to go along with your character. A Class is what your character specializes in. You may pick one specialty. An example would be Warrior. There are also various staff positions available if you would like to be on the staff. Just post what faction you work for in the "Guild" area. Blue Faction: The part of the staff that works on the “technical” problems of the game. They fix lag, loading errors, and all that jazz. However, they are the masterminds also behind creating this technology. Orange Faction: the staff members that host the events on this game. They are the ones who also announce the new rare items, events, and quests to come. They have a hand in creating those. Enjoy making your accounts and getting ready for the launch of FantasyWorld 2.0! Personality: An extremely snobby young lady who believes that she is the best. She always gets what she wants, leading her to believe she is entitled to get whatever her desire is. She rarely thinks of others in the real world or in the game, and is very self-centered. She is self-conscious about herself in her school and videogame life. She however will always give it her all, believing that she can do it alone and will repel the help of others. Her determination and pride is what drives her. 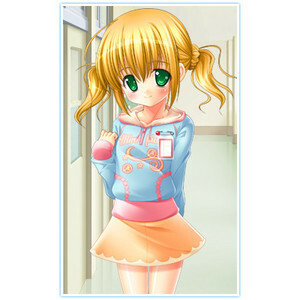 Background: Lucy lives with her father as well as her little sister, Lucky. She lives in a mansion due to the fact her father is the inventor of FANTASYWORLD Online, and is now a millionaire. She goes to the richest private school on the block, and is involved in cheerleading as well as honors classes. Note: Nekolen's ears are black, and she has a hood attached to the back of her coat. This is the outfit WITHOUT Armor. This is what she had on under her coat. 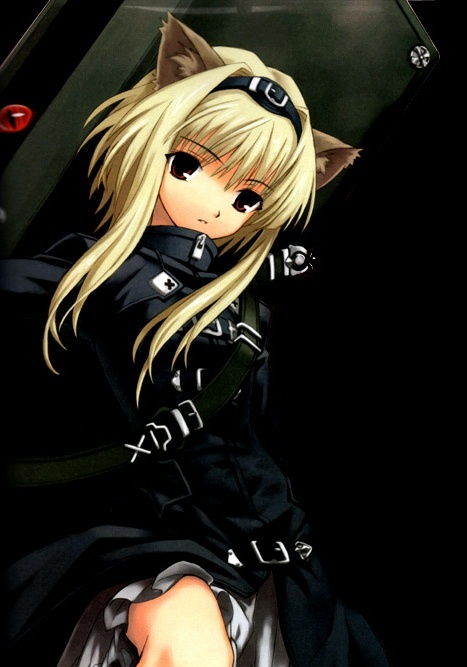 Description: Nekos are a catlike race that have cat ears on their head and cat tails. Abilities: Has claws; Transform into a cat; enhanced reflexes used to be stealthier and sneakier. Character Weapon(s):Nekolen fights were her claws as well as a sword. Character Abilities: Fire Magic on the side, but her magic is not as strong as one would think. Guild Memberships: Warrior Guild, Hunting Guild. Player History: Everybody knows that the player Nekolen doesn't have many allies, but she is best friends with McSkull. Nekolen is known for being the top player on the game, always winning the big tournaments and having the best skill in battle. She is the leader of the warrior guild. Nekolen is notorious for never using her microphone and always using the chatbox to type to. Her gender is a mystery to many players on the game. Personality: Francis is very soft spoken in real life. He has no friends other than his friends online (mostly Nekolen) and is at peace with that. He tries to be very considerate of others and is quick to help someone in need. Francis tries to take the role of leadership in any way that he can, but mostly online. Background: Both of Francis' parents work constantly, which is why he has so much time to play FantasyWorld. He is an only child. Everyday after school the first thing he does is head towards his computer usually until he is tired enough sleep; and everyday is a repeat of the last. He has no responsibilities, no other friends, nothing. Just him and his game. Character Abilities: (Captain) McSkull is an undead pirate. He is able to absorb any attacks from swords or guns. He can also raise up many more of the undead by casting a spell on the grounds beneath battle. Player History: Caesar is very well-known around the gaming community. He takes a role of leadership in the Warrior Guild with his best friend on the game, Nekolen. He is also known for setting records on the dungeons based on speed and overall points. Roleplay: A "Game of Life and Death/ A "Game" of Virtual vs. 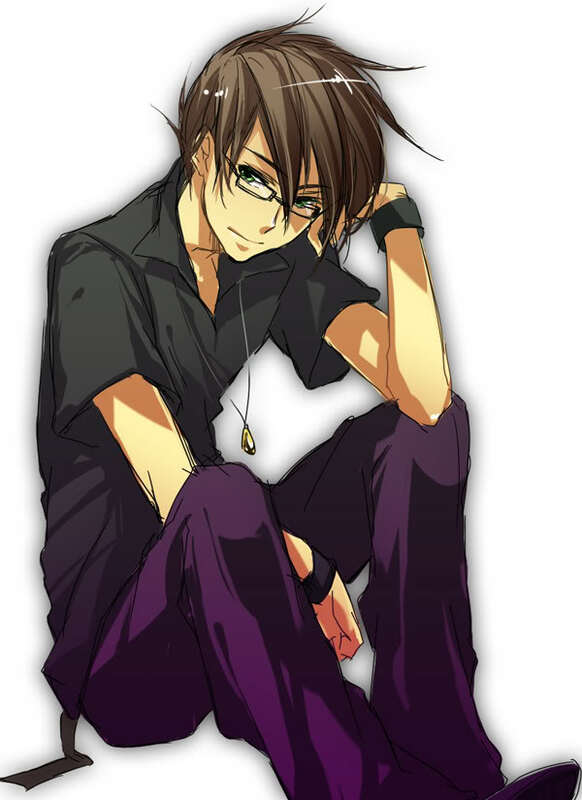 Reality Name: Cody Morris Age: 16 Gender: Male Personality: For the most part, laid-back and carefree. He tends to take things in stride. Background: In reality, one of the people you wouldn't notice from the crowd. He makes low-A grades, and when he's not doing homework or being beaten by his parents he's playing video games. Just a typical teenage boy, really. He has recently gained an online girlfriend, Nekolen, but he believes he has met her in real life. Character Name: Injustice11 Race: Human Weapon(s): Orkish Warhammer* Abilities: Abilities: InJustice is incredibly physically powerful, single-handily ripping through entire clan dungeons using his Warhammer alone. Even without his weapons, he is a massive fighting force, with master-level hand to hand skills. His Orkish-god armor, referred to as the Sacred Armor of Galahorst, only helps to enhance this. 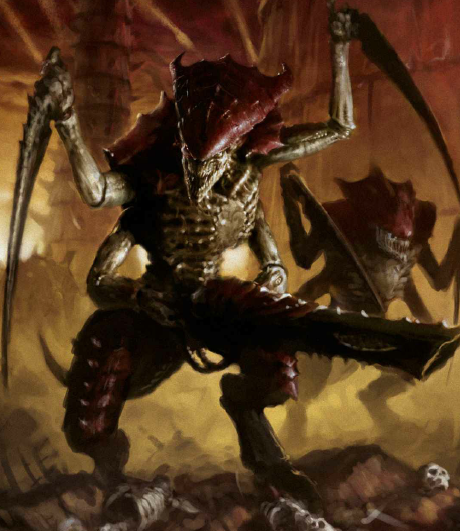 As such, the active effects on him in total are: Orkish Brutality (Training and tutelage with an Orkish leader since level 1 has significantly increased his prowess with two-handed weapons and heavy armor.) Sacred Blessing (The Orkish armor of the god Galahorst is enchanted with increased prowess in two-handed weapons and heavy armor, however boasts an increased weakness to magical attacks) and finally Bane of the Land (All players up until half of his current level have their stamina stats reduced slightly in your prescience.) Rare item: Sacred Armor of Galahorst* Guild: Warrior Guild Level: 375 Game Rank: Warrior Guild Admin (Later, Regime Enforcer) Appearance: Underneath his heavy armor is a gruff looking man with many scars concerning him from many battles. His hair is a dark brown, whch is slicked back to neck length. His eyes are a dark green. His armor is a dark green with Orkish scriptures covering it, these scriptures of which glow in the sun. His armor is replaced with Regime Enforcer armor later on, a picture of which I shall post below. *Player History: He was among the many players that helped Len to stop the hacker, her father, from taking over the game. During this time he slowly started to fall for her until when she was on the brink of death, then he kissed her and that was the start of their romantic relationship. He now acts as her second-in-command for just about everything, and since he is fiercely loyal he will do anything for her. Roleplay: Renegades of Justice. Superhero Name: Ranger Real Name: Cody Morris Gender: Male Power(s): Psammokinesis (sand manipulation). Using his abilities, he can create and manipulate sand to his whims, including transforming himself into sand, summoning sand (and in some cases at full power, sandstorms) among other abilities. Appearance:[img]http://images4.wikia.nocookie.net/__cb20120511221137/specops/images/9/90/Lugo.png[/img] Personality: Unlike most military members, Morris is surprisingly light-hearted and chill. Despite his light-hearted, playful personality, he suffers from PTSD, which his nemesis Graza uses to her advantage. Nemesis: Graza, a succubus. Other: His best friend and lover is the alter-ego of Graza. A former member of the U.S Army Rangers. Roleplay: Magikica Heights Name: Qalateqa, often called Q for short Age: 18 Year: 12 House: Yellow Guild: Dark Specialty: Summoning Personality: Q is naturally soft-spoken, but when he does speak it's definitely important. His allegiances with the dark guild don't make him evil persay, but just unintentionally malicious. He is a bit anti-social, but unfalteringly loyal. Appearance: [img]http://farm9.staticflickr.com/8522/8583172053_a69b3cb4a3_b.jpg[/img]Background: Qalateqa was raised by a shamanistic tribe in his early years until he turned 13, when he was found by a group of scouters and sent to MH. While he is often shunned and feared by students of all houses, even his own, for his strange dress and anti-social nature, he is highly respected by his teachers by his quick and malleable learning style, and how his good behavior serves as an example to the other students. His time in the tribe has made him very in-tune with the spirit world, often calling upon the spirits of his ancestors for advice. 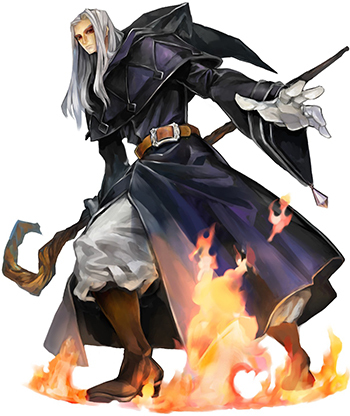 This has also made him a master of the Summoning class, regarded by his teachers as one of the best summoners in history, especially for his age. Recently he has fallen in league with the dark guild, as both he and certain spirits agree that it is time for a new authority to take over the institution. Personality: While considered popular around his school, he is very passive about his standing in the hierarchy of high school. Calm, cool, and collected, he's the one people most often go to advice, even though they often leave with nothing more than confused Jiminy Cricket. While he doesn't consider himself a leader, he does consider himself a guide, and is willing to help those who genuinely seek assistance. Background: Since his mother was taken away from him at a young age due to consistent alcohol abuse, he has lived with his relatively wealthy father for most of his life. However, Jason refuses to partake in the many luxuries associated with his father's lifestyle, although he couldn't resist participating in FantasyWorld, who his father does marketing for. His FantasyWorld adventures serve as an escape not only from the expectations of his father, but also the hole in his heart from his lack of a mother, who is supposedly on the way to a religiously fueled recovery. Maybe this influenced his character? Character Weapon(s): A bo staff infused with divine power, causing a holy effect on enemies. This is especially effect against minions of the game's more demonic elements, but still causes extra holy fire damage to regular enemies as well. 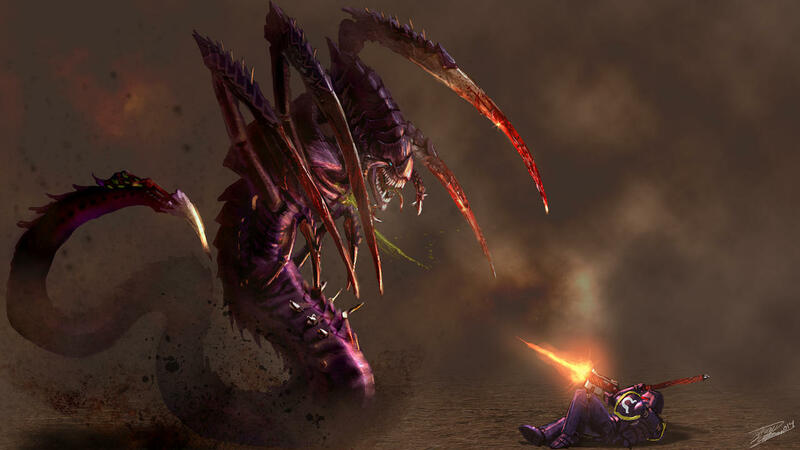 On lower level enemies, it can even absolve and convert them into minions for a brief period of time. Character Abilities: In addition to above-average agility, 99's main skill lies in his mastery of the divine skill tree, albeit in the offensive section. Thus, he can call down many holy attacks, including lightning strikes, sun rays, and many others. He also has healing capabilities, but not anywhere near an average cleric. Rare item: The Cross of the Sun, which greatly enhances all of his divine abilities and his health, rendering him a huge threat on the battlefield and as a healer. 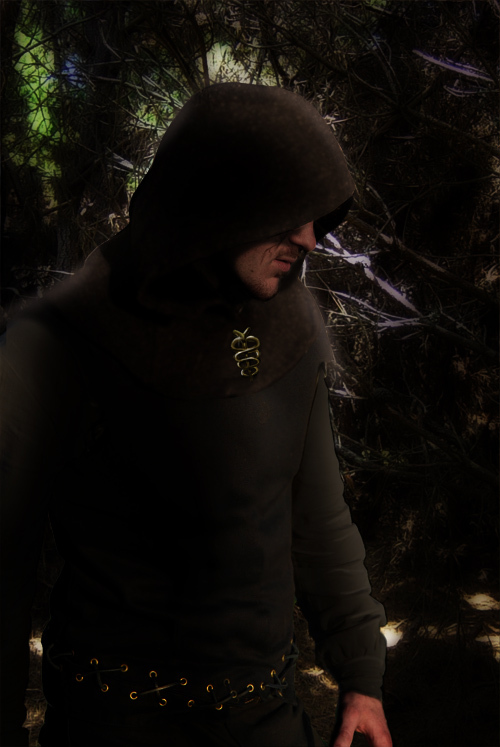 Player History: 99 is the highest ranking member of the Cleric's Guild, making him the first Cleric to even make it into the top 100. While many prefer warriors, 99 has shown that all types of characters have their own strengths and weaknesses. He has served as a guide for all those who ask, and has yet to deny anyone. Personality: Chuck is hardy and likes to keep to himself mostly. He is average in...everything. Average life, average grades, average teenager. However, he is on the school's baseball team, and many girls adore him for that reason. However, when he holds a passion for something, he will become enthusiastic about it and be happy you share a similar interest. He also hates it when someone looks down upon him, as he always tries his best. Background: Chuck lives with his father, as his mother passed away due to illness a few years ago. His father hasn't been the same since, always moping around and asking Chuck to do everything. Chuck tries his best to hide his emotions of his lost one, and strives to move forward in his life. He joined Game to escape reality for a while, and enjoy himself. T-Cloud carries around a bag with a variety of spell books. He quickly can flip through them and cast devastating spells. He also carries around a small, retractable staff that he can use in close-combat. However, the Staff can be used to heighten Weather Magic, his specialty. Character Abilities: T-Cloud specializes in Weather Magic (Mostly Wind and Lighting) and he can cast devastating spells from those categories. His lighting spells can hit mostly from a distance, but can help him get out of a pinch with temporarily paralyzing someone. He uses wind to blow back enemies or use it to slice through their armor (The catch is that it takes longer to cast a Wind Spell than a Lighting Spell). He can also use the other elements, but those spells tend to be very weak. Rare item: Staff of the Eagle: This will boost his magic power greatly and help him cast the deadliest Lighting Spells in the books. However, the staff can only be used for one attack and then has to cool off for a long period of time. The yellow-bulb at the end of the staff indicates when it is ready to be used again. Player History: ThunderCloud only joined Game not too long ago. 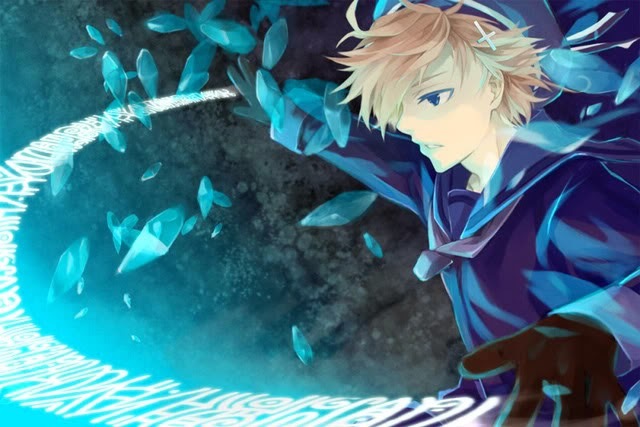 However, he is extremely good at being a mage and rose to be able to join the guild. 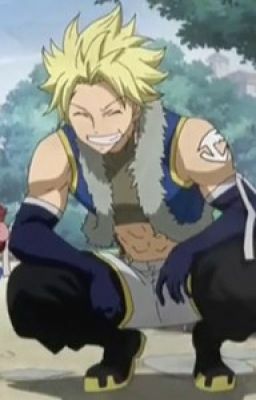 He is an average member of the guild, helping them out whenever he can. He is just an average player that most of the top players ignore. Personality: Is Astrid shy and soft spoken or is she hiding something? It’s a patient quiet. Waiting on something. Waiting for you to speak and reveal all there is to know about yourself. And there's an eerie calm about her. A cold confidence of sorts. All with a near expressionless face and cutely aloof demeanor. She tends to be a bit dry and inflectionless, as well as easily distracted. 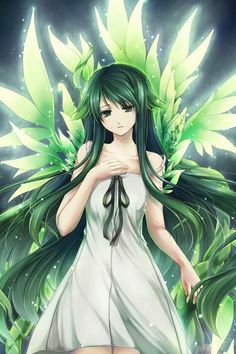 She is very emotionally repressed but also polite and seems to exude as much childlike innocence as ominous lurking, resulting in many treating her like a child, despite her seniority over them, patting her on the head and such. Which she doesn't appear to mind, one way or the other. Aster is a writer of grim stories, having drawn her inspiration from mystery & suspense novels and horror films throughout the years. She’s an English Major, despite the desires of her parents that she might becomes something more typical. Despite this, she has a rather mousy demeanor, with which she allows herself to get walked all over. If not for her dearest friend, Salem, she would have very little. Salem eventually tells Aster about a new MMO for them to try out. FANTASYWORLD. Astrid carries around a pair of onyx daggers on her person, which are pointed and double as wands, allowing them to be used to focus and aim magic. She only uses them, however, when she is separated from her coffin. While she could, in theory, use them with her coffin on, the coffin’s awkward shape isn’t conducive to utilizing these. Physique - Aside from the standard abilities of a Cleric, Astrid’s lugging around a coffin twice her size has apparently contributed to her physical capability. Having trained with it for a time, Astrid can now move as freely with it strapped to her back as she could before without it. And when it is removed, she is that much faster. It’s also contributed to her strength, meaning she has little problem slinging the thing around to use as a bludgeon or shield. Maker of Deals – It appears as one of her Character Titles, yet it mysteriously lacks a description. One would assume, however, that it implies she’s good at selling things, being that she is a merchant. Dark Cleric - A Dark Cleric is exactly what it sounds like. A reverse cleric. All the same abilities, but tied to malevolent forces, rather than benevolent ones. Thus they have diffract effects. Her wards aren't as strong, but anyone who hits them gets damaged for their trouble. She doesn't heal as much damage, but she heals by leeching life from her opponents and bestowing it upon herself or her allies. And rather than summon angelic spirits, she can summon demonic ones. Her offensive magics possess the dark element, rather than the light one. Legion - Astrid has a psychic connection to Legion. She sees what he sees and vice versa. They can read one another for total synergy on the field of battle, which is how they're such a fluid combination. They can also communicate non-verbally. Guild Memberships: Astrid pulls double duty, falling into both the Supporter's Guild and the Merchant's Guild. Legion – The Coffin Astrid lugs around is a twofer. It acts as both a seemingly bottomless inventory bag, and as the medium through which Astrid can trap spirits and summon them later to do her bidding. It is bound to the creature of the same name, which drags things into the coffin once they’re defeated and adds them to itself, allowing Astrid to summon them. The shadowy black hands that reach out and act as Astrid’s defense and offense when she’s armed with the coffin belong to Legion. As Legion is a demon, it is both strong against and vulnerable to the holy talents of Clerics. When using Legion, Astrid tends to play the opportunist. She waits for the moves of her opponents and responds accordingly, while directing Legion’s arms to attack or defend. Items: Astrid holds onto very few of the items she acquires, preferring to sell them as wares in her store. Hardly anyone knows even the slightest detail about Astrid. She keeps to herself and doesn’t appear in public often. Despite being a member of two guilds, she attends no meetings. She has no friends or steadfast allies. Astrid’s affiliation with the Supporters Guild allows her on expeditions with individual plays and collected groups. While on these expeditions, whatever item drops she finds, she can keep for use in her store. In return, she holds the items found by her charges, acting as an expansion to their inventory, and backs them up when necessary. Where most supporters are rogues who back up their charges with suppressing fire from bows and crossbows, Astrid is a Cleric. She backs up her charges with more… varied methods, including protective wards and revitalization, and a pair of inky black shadow hands. Strangely, Astrid always seems to be well funded, despite her charges getting 85% of the looted gold on expeditions and her only known shop being particularly modest in price and selection. Description: In the coffin Astrid carries around is a red eyed demon with a Cheshire grin, full of razor sharp teeth. When the coffin opens and one peers inside, this is all one sees, should Legion decide to reveal himself. The rest is endless shadow. 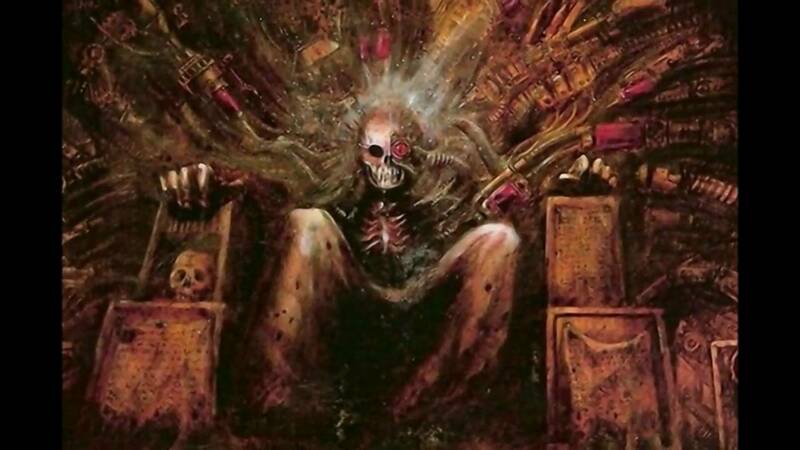 The demon's true form is unknown. Even Astrid isn't aware of what he actually looks like. When he appears to her in their "Mind Space" it's as the coffin. Personality: Legion is many things. One minute he can seem little more than a lunatic, laughing ominously and uncontrollably, deeply enjoying himself and reveling in the chaos he incites. However, he can just as easily present himself as a sly negotiator and a master manipulator who's playing you into the palm of his hand. Personality: Faye is wise, slightly sassy, and childishly curious. She has a real upbeat attitude and is generally happy. She always wants to help others and does her best to help the players with anything they need. 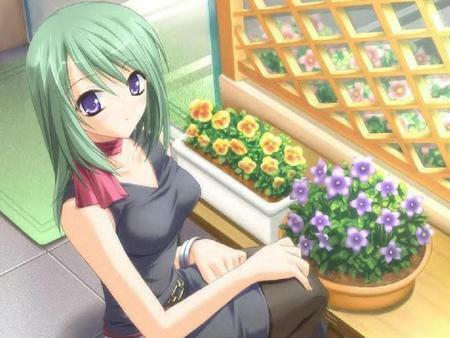 She also has a thing for flowers, so players that are low on money sometimes gives her flowers in a vase for her shop. Background: An NPC found in game who owns a tailor shop. Players tend to come in for customized clothing and accessories, sometimes even allowing item drops to be sewn in. When players stop in, Faye chats with them, offering wisdom and advice. She offers directions on distance locations on the map and informs players of upcoming events, like the main tournament. 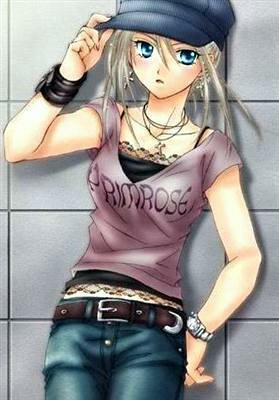 Personality: Rose has been described as having a rare and beautiful spirit about her. She's a paragon. A pillar of humility and a rock of compassion, as well as a scion of fairness when she can be, helping those in need when possible. In her mind, the world should be simple. She is a determined woman, if nothing else. She's willful, clever, and a natural born leader, despite her typical role as a follower. She's incredibly civil and diplomatic, preferring to avoid conflict where possible. But if it can't be helped, it can't be helped. And if she finds herself in that uncomfortable situation, she'll fight like mad to get out of it. She will come to anyone's defense as well and holds to the philosophy of "Punish the Crime, Pity the Criminal." She also doesn't believe it is the duty of the strong to protect to weak, rather that no one is entirely strong or entirely weak and it is the duty of all peoples to help one another overcome their weaknesses. In game, she has proven to be something of a tactical and strategic wizard, having proven fully capable of thinking up advanced strategies in the field. She's also a team player, typically, preferring to work with people, rather than against them. Rose is a rather laid-back girl and enjoys the simple things in life. She loves food and cooking, she enjoys reading and she likes mingling and music. She's incredibly sentimental as well, holding onto things for long periods of time. However, this long memory also reaches into the less pleasant events of her past, occasionally leading to self doubt. Rose does enjoy keeping up her appearance. Rose is almost good to a fault and it has a way of occasionally turning against her. While she's certainly no fool, her selflessness has led to difficult situations. She tends to be particularly hard on herself, almost to the point of it being unhealthy. Rose also has some trust issues. Not exactly issues trusting other people, rather than having a severe reaction to her trust being betrayed. When she was younger she was particularly ill and meek. She'd get picked on, often, until the day a friend stood up for her. Ever since that day, she's done everything she could to lead that example and try to be the best person she possibly could. Magic Cancel - An ability unique to Paladin Templars, Magic Cancel allows the user to neutralize magic in battle, though not completely. Status Magic and Weaker offensive magic is canceled, leaving opposing mages with limited options. Though these options generally consist of their more dangerous spells. A trade off as dangerous for the Templar as the mage on the receiving end, if they aren't careful to strategize the use of this ability. Also cancels summons, bar those by Light Clerics or those not magical in nature (such as a ranger, calling on an animal ally). Templar's Blessing - Templars are essentially Paladins with some Clerical abilities, granting them access to a unique holy skill tree. This includes Rejuvenate (a low power self heal and status remover), Photon Beam (a health dependent beam of holy light), and Christened Slash (Augmenting a bladed weapon with holy energy, enabling it to create a force slash through just about anything and has Sunder, thus ignoring armor). Then there's the buff, Invocation (Essentially the equivalent of shouting SHAZAM! Excessively boosts all stats and abilities to about 5x their typical output for two minutes but requires the player be at 25% Health or Lower. Activation of this skill causes a bolt of lightning to strike down on the user, generating a minor explosion that forces enemies back and can deal some major damage if they're too close). A guild forged after the events that trap players in the game, formed up of higher level members who've decided to commit themselves to using their skills for good deeds to make sure as many people survive the ordeal as possible until someone finds a means of getting everyone out of the game. Mythril Armor - Though it may look light, Arier's suit is actually classified as Heavy Armor. Despite its being incredibly light, it has one of the best armor ratings in the game (at least in the previous game) and is nigh impervious to physical damage. Penetrating her armor isn't something that'll be happening unless you have insanely powerful weaponry. The armor is likewise enchanted, improving the player's own personal defense, significantly reducing incoming damage to the player as visually represented by their skin seemingly being incredibly tough, but it's really just an invisible magical aura, protecting any exposed portion of their body, turns all Piercing damage into Blunt damage. It also increases its wearer's Agility. It does, however, come at the cost of 50% lowered magic resistance. Arier's inventory consists primarily of practical items, such as healing tonics and the like. However, she does also carry a jewel encrusted comb and a matching compact mirror. Arier is an incredibly noteworthy player, having even been granted a nickname by many of her fellow players in the Warriors Guild: Paladin Princess. Despite the title, it is technically undeserved. Every PvP match Arier has ever won was the result of her forcing her opponent to forfeit, rather than by actually killing them. Likely because she doesn't even like PvP and avoids it like the plague. Speaking of avoiding things, Arier also does what she can to steer clear of the Warriors Guild figureheads, seeing as she dodges PvP matches, events, and tournaments. Arier was actually begged by other members of the guild to ask if she could join. She did so, despite her distaste for the idea, and was accepted. Just another name in the hat to boost the reputation of the Warriors Guild. But it is fairly evident she has no interest in being the strongest. She's been known to step in and help players newer than her around the game, teaching them the ropes and the like. Arier has never participated in an official tournament. Her rank is the result of massive amounts of level grinding and participating in non-PvP events either alone or with groups. Many like to compare her to the leader of the Warriors Guild, Nekolen. Some measure attractiveness, some measure sociability, and others just wanna know who'd win in a fight. Arier never weighs in on these debates, however. Primarily because they aren't questions she needs the answers to. Personality: A carefree, energetic girl who generally thinks in a "glass half full" attitude. She's usually straightforward and sometimes blunt, but she's smart enough to know how to turn it off in certain situations. She makes sarcastic comments and jokes. Even while in battle in game, she will fight with a smile, making comments if she knows its an easy opponent. She is a bit vain, and insulting or vandalizing her sense of taste sets her off. Even in the mist of her being flippant, there is a deceptive layer of maturity. You don't always see how insightful she really is. Background: Melanie is a college student from the city's edge. She is still an undecided major but is trying to narrow something down that involves traveling. She likes going to the mall with friends, yes to shop but also for the interactions with random people, which is why she likes medieval fairs as well. Melanie found FANTASYWORLD while trying to stay in contact with high school friends, a bonding mechanism for college friends, personal amusement when she wants, and something to do between classes and projects. Character Abilities: Hunting, Tracking, enough agility and endurance to do those well. Guild Memberships: Hunting Guild, Warrior Guild, Rogue Guild, Honorary Assassin Guild. Honorary Animal Guild. 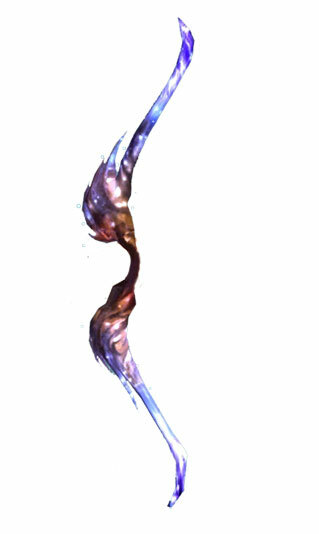 Bow of Eldrin - An arcane bladed recurve bow. Not just good for archery, it splits into two hand blades, one gripped overhand and underhand. Plus, shoots a mild range of magical arrows. Made to specialize in both range and close combat. Blade tends to save the special ones for intense fights, using normal arrows otherwise. 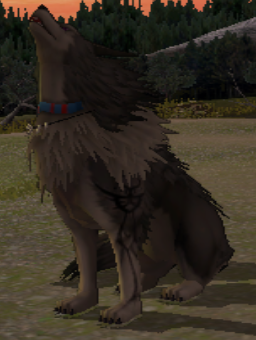 Blade has a wolf companion she got from a rare mission in the first installment of the game. He fights with her when instructed, but has a caretaker for when she needs to do solo missions. He wears arcane feathers along the side of his head that match Blade's arrows. These feathers not only please Blade's interests in fashion, but also supplement the wolf with raised health and attack stats, along with a weak health replenishing spell. 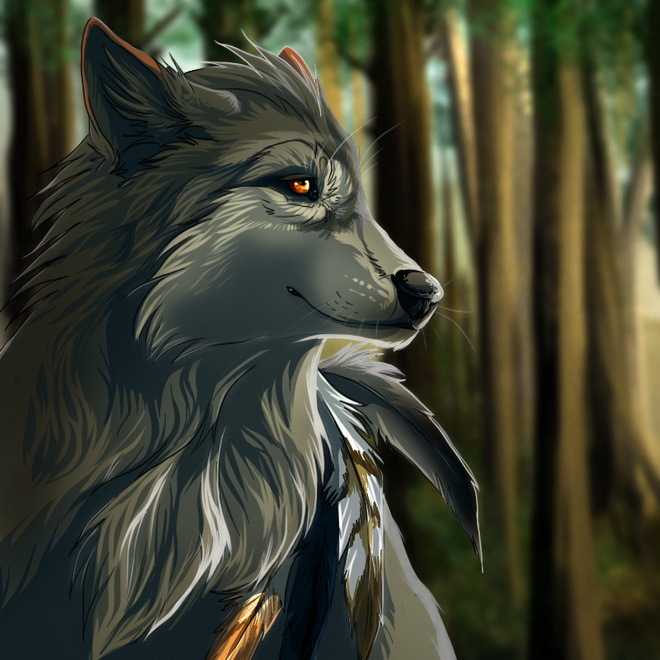 Player History: Back in the first game, CanineBlade was convinced by SilverLeaf and Loyalty20 to get her companion, the wolf Strider, for her chosen avatar. The wolf has been handy on missions a plenty. Blade keeps herself busy doing anything and everything. Being a ranger, she has access to multiple guilds from the get go, then she has friends and acquaintances in a few others. It's not like she signs up for every mission herself though. No. Usually she's off exploring and doing a small task and someone calls her up to help with a problem in the area. Blade generally joins in the missions for the thrill and challenge, though she does have a serious side for assassination missions. She actually loves fetch quests and monster extermination quests do to the traveling involved, but there is a thrill in sparring matches when her opponents mistake her carefree humorous attitude as a push over. Personality: Shy, and generally has low self-esteem. Hadrian is a genuinely nice kid, but he's very self-depreciating, and can be kind of depressing to put up with. He always tries extremely hard, as though he's desperate to get any kind of approval or acknowledgement. Once he has friends, though, he takes looking after them very, very seriously. He's very much a doggedly nice person, constantly doing favors and giving out things without expecting anything in return. Tends to grumble a lot, but if he ever goes completely blank-faced and impassive, run. Or don't. You're probably doomed either way. Background: Grew up as part of a wealthy, aristocratic family, and was expected to conform and act as a good heir to their business. Unfortunately for him, he showed little drive or talent for corporate interests, and was quickly cast aside in favor of his younger, middle sister. This embittered him, but also destroyed his confidence, creating his inferiority complex. He lives a life of luxury, comparatively, but he has little in the way of what most would consider friends or family. He spends most of his time playing video games, and joined FANTASYWORLD as a form of escapism, and perhaps to make a few friends. Description: Draconids are basically humans with slight dragonic traits. They look human, but their eyes are slitted and reptilian, and their skin and hair are sometimes odd colors. Abilities: Enhanced durability, lower cool-down periods. Explained under "Character Abilities". Flaws: Slight fire weakness, weak to anti-dragon weaponry. Character Abilities: Dread Knight- A figure of fear and intimidation, Dread Knights are the darker cousins of the Paladin class. They have immense defense and above-average strength. They can also move quicker than expected from an armored knight, but they have little versatility, and tend to rely on high stats and good teamwork to carry the day. Armor of Fafnir- A Draconid exclusive skill. Gives his skin and body the defensive properties of mid-tier metal armor. This includes a slight weakness to fire, but the trade-off is more than worth it. Galvanism- Cuts cool-down from negative statuses, effects, and the user's own attacks in half. Another Draconid exclusive. Prana Burst- The ability to increase the body's output by flooding it with magic power. Can double or even triple physical ability, but only lasts for a very brief period (hence "burst"), and has a twenty second cool-down period afterwards. Insight- Acquired from the Occult Scroll rare item he obtained from the Gaza Dungeon. Insight allows the player to scan their opponent and obtain the specs of their class, their equipped weapons and their effects, and their highest stat. Not a perfect scan by any means, but definitely a big help to a strategist like Sable. Description: The Sweepers Guild is generally for low-level players to join early on, in order to quickly gain experience and levels. They mostly take group quests, and level grind with the backup of a somewhat stronger player. Some players call them "bottom feeders" to belittle them, but the more experienced members will really take it personally if they do. Player History: Sable started off strong and joined the Sweepers Guild early on, leveling up a lot and gaining strength quickly. Most players leave once they hit level 80 or so, but Sable stuck around because it's the best way to make new friends. Ultimately, he ended up keeping watch over larger and larger groups of players, and developed a reputation for never losing a teammate. His awkwardness combined with his great (for a Sweeper) strength caused others to call him "The Sixth Ranger," after the character position in Super Sentai shows (the sixth ranger typically has a powerful trump card and is extremely capable, but doesn't mix well with the rest of the team). Personality: A definite big sister type. A bit rough and coarse, but very kind. She founded the Sweepers Guild in an attempt to help others get started, since it helps take her mind off of her situation. Background: Karen was a professional thespian and Broadway starlet before she was involved in a terrible car accident. She survived, but her injuries cost her an eye, as well as all mobility in her legs. Since then, she's been confined to the hospital, wasting away without a purpose in life. She started getting interested in VR games because she was baited into doing them with the idea that it'd be as close as possible to having her legs again, though there was nothing that could be done about her eye. Description: Wolf ears and tail are a result of her wolf familiar Ulfir. Abilities: Great stamina, enhanced senses of hearing and smell, and resistance to cold. Flaws: Weak to silver weaponry. Techniques involving loud noises and foul smells can create longer/more painful negative effects. Character Weapon(s): Twin chained spike-daggers. Character Abilities: Beastmaster- A class solely intended to control and fight alongside animal familiars. Gains the strengths and characteristics of their most common familiar, along with their weaknesses. Can have up to three familiars, but can only use one at a time. Description: A horse-sized black wolf. Andi's favorite, and most versatile summon. A great tracker, mount, fighter, trapper, and pet. Sometimes, she'll just keep him out to play for a while, so he knows and is friendly with most of Andi's acquaintances. Skills: Tearing Earth Paw- Tears up the ground in a straight line towards the target. Deals moderate Earth elemental damage. Earth Wall- Exactly what it says on the tin; a hardened wall of earth, called up for defense. Description: Basically Andi's "anti-boss" familiar. Extremely powerful, but very one-dimensional as an aerial combatant and horrendously draining to use. 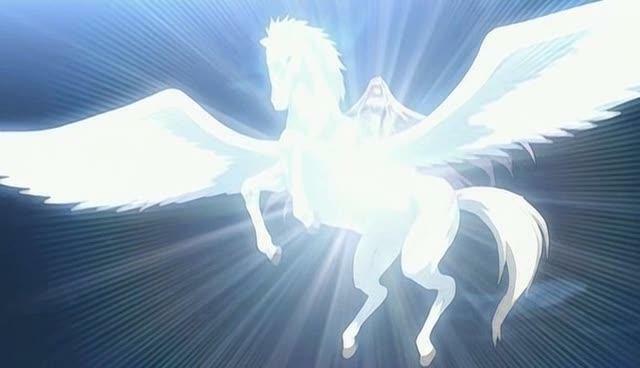 Skills: Divine Comet- Bellerophon surrounds herself with a curtain of holy energy, then dives in a maximum-speed aerial charge, ending in a full-body tackle. Does absolutely massive damage, but costs a massive amount of energy. Great Wingbeats- Bellerophon flaps her wings rapidly to generate holy-element shockwaves. Powerful enough to stagger enemies, but doesn't do much damage unless it's sustained over an extended period. Description: A large snake, comparable to a giant Anaconda. Except with actual fangs in addition to being a constrictor. Yeah, this guy's a beast. Andi mainly uses him to tie up or slow down enemies. Skills: Paralytic Toxin- Mandala's venom is a powerful paralysis serum, capable of causing painful muscle paralysis. Coil Crush- Basically just an extensively strong constricting attack. Player History: Founder and leader of the Sweepers Guild. Despite the Sweepers' derogatory status as "bottom feeders", Andi is one of the strongest and most feared players in the game. She developed a reputation in PvP for completely running roughshod over more specialized opponents due to the varied skills of the Beastmaster class. Andi has a sort of half-rivalry, half-grudging friendship with Nekolen, whom she calls "Lennie" just because it annoys them. 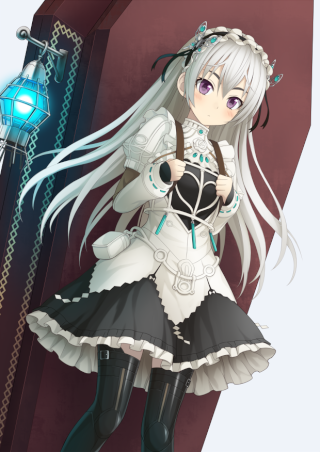 She's fond of Sable and thinks of him as a good friend and a protegee, as well as a potential successor to lead the Sweepers Guild if she ever passes on or moves on to something else. Background: "Money makes the world work. Money makes you live and die. Money makes you stay plugged into the game and money makes you stay alive. Without it you are just an obstacle that needs to be deleted for others to make money. Let there be no hard feelings, it’s merely business." I will be making multiple characters / monsters as the game goes forth. Some working for The Syndicate and some against. Also one for the actually Syndicate which is one listed below. (who is a character him/herself). Character Weapon(s): Glowing claws that change colors based on emotions or thoughts. Character Abilities: Every attack, special, and spell in the game plus a few unreleased treats. Guild Memberships: Top rank of Blue, Orange, Green and Red factions. Also part of secret Umbra faction. Rare item: Delete Key: Not so much an item but associated with his weapons. When he touches stuff with his claws he can immediately choose to delete touched items from the game. If he holds a player for more than 3 seconds he can forcefully cause them to disconnect from the servers. Untouchable: Armor nullifies all effects and abilities on him. Greatly reduces damage taken. Items: Whatever he wants he can materialize. Player History: Mythological being, people don’t know if player, monster or NPC. Very rare sightings, some don’t even believe he exists. Even screenshots or photos of him have never been released. Personality: Friendly, generous and kind. Can be easily be walked over but will stand up for his friends. Photo I.D (Appearance): Him with his father. Background: Jared joined with the illusive Violet Faction when his family was forcible taken from his home. His home was then demolished to make way for larger headquarters for FantasyWorld’s parent company. Jared’s father refused to sell the family land and wound up dead in a car accident. Interesting enough the news or media did not mention the 43 bullet holes also found in his body even after reported by the police as a murder. After his death the company showed up with records indicating that the Greshin’s had sold the property to them and were evicted. The Violet Faction reached out to him due to his great computer science skills. Since then that have been sneaking in under FanstasyWorld’s eyes and gathering evidence of foul play. Character Abilities: Protective magics are his main. If needed he can call on his blood magic for offensive attacks. Hacked Ability: Zero Barrier - sends out waves that interrupt code, making things unable to function properly while in the wave and short time afterwards. Cannot maintain for long. Must remain stationary and uninterrupted to use the zero barrier. Rare item: Hackers Staff - programmed to look and read as a low level wizards staff this item provides M15ery the ability to decrypt and hack areas to gain access to FantasyWorld’s parent companies servers and steal useful data. Player History: M15ery works very hard to be unnoticed. He goes about business daily to look like a plain old low level player. People he trusts are far and few and he tries to use large events to sneak in under commotion and log into illegal access ports. I infect the entire net. I have spread through systems, peoples and cities. To this place…FantasyWorld. Background: The Red Terror doesn't have a background because it doesn’t have a history. It deletes it, every time it does find a code it wants it devours and grows stronger. Shedding it’s previous form and creating itself anew. The Red Terror is not bound by a single identity either. Those not powerful enough to aid in the evolution of the virus become part of it, spreading the virus just as the original did. Due to this it makes it almost impossible to know if you have eradicated the virus fully. A few specialists claim that the original has an anomaly in its code making it detectable but since the virus has never been eradicated this claim is not verified by any means. 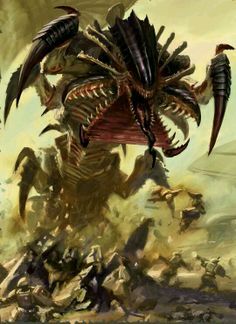 Character Abilities: Viral Infection = Any time The Red Terror comes into contact with something it thinks can make it stronger it will immediately begin a viral takeover. Anything touched or touching The Red Terror immediately becomes infected and slowly transformed. If the original creature delivering the infection is defeated then the takeover will stop. But if takeover completed the item, person or environment is permanently lost. Other abilities are based on original creature and amplified by new monstrous features. Trapper doesn't reveal her actual name to anyone, seemingly out of some sense of escapism, rather than any effort to be mysterious. Personality: Trapper is a carefree, fast-talking, eccentric woman with an offbeat sense of... everything. She's full of boundless energy and an unquenchable thirst for knowledge. She's loud, jovial, and seems to rarely ever be truly, deeply bothered by anything, sporting a big ol' grin, if only to keep up everyone's spirits. She's also something of an opportunist and a "forward thinker," putting forth that she's far more intelligent than she seems... and she seems pretty intelligent. As a Gadgeteer, Trapper's stat spread includes incredibly high Cunning(Intelligence) and Dexterity. Meaning that she's perfect for threat analysis & diffusion (traps), situation deconstruction, and is fairly nimble. She has incredibly precise aim, and a naturally high critical chance to accompany the more aesthetic boosts. As an Elf, Trapper has the base stat set of such, which includes a fairly high spread into Speed, Dexterity, Magic, and Mana at the cost of lower spread to strength, physical defense, and constitution. As such, the game of an elf is generally to strike fast, strike hard, and avoid getting struck. Zap Coils - Trapper's signature weapons are gauntlets only usable by players of one of the Tech classes. They sport a coil, which can become electrically charged, thus electrifying her strikes and having the potential to cause Stun, even by mere touch. Or the coils can be extended and used as lightning whips or high-power taser ropes. Elven Blood - As an elf, Trapper has a 50% resistance to magic as well as a proficiency with magic, regardless of what her class may be. While it is not of the caliber of a true mage, Trapper is capable of using the basic-tier elemental spells (fire bolt, frostbite, thunder jolt, razor wind, stone blast, hydro gun, chakram leaf) and enchanting items with the elements. Tinkerer - Gadgeteers possess the "Tinkerer" ability, allowing them to use resources to craft more than the basic tier items and traps, instead allowing them to craft incredibly unique, useful items on the fly, even in the middle of a fight, provided they have the resources. This is essentially the "kid-brother" ability to the Engineer's "Inventor." 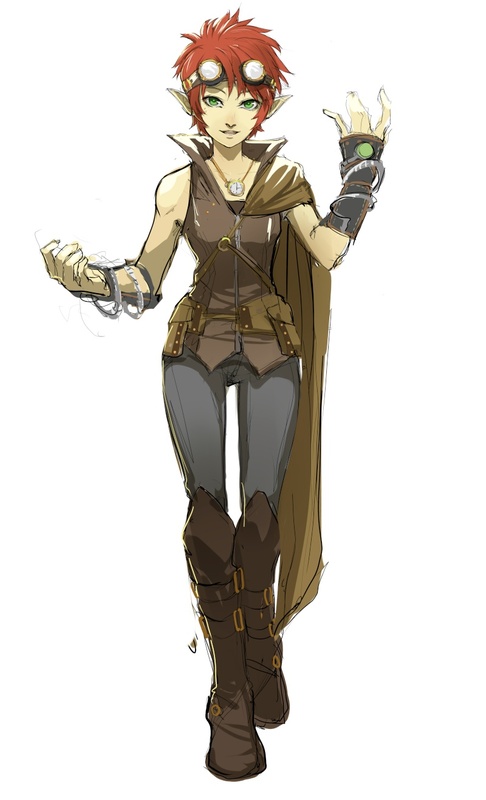 Tactical Sense - Trapper has unlocked the incredibly rare and coveted "Tactical Sense" ability, unique to the Tech-oriented classes, which allows her to essentially peak into the stat specifics of an opponent to determine their strengths and weaknesses. This allows her to exploit those weaknesses for an increased Critical Chance on her own attacks. She can also see her opponent's move pool, allowing her to preempt special attacks. She can also see the battlefield, processing information at speeds beyond other players, allowing her to easily scope out for weak points, points-of-interest, field advantages and resources, and so-on. Ex-Tech Guild - One way or another, Trapper got herself kicked out of the Tech Guild. And yet none of the members will divulge how, exactly, she managed to accomplish this. That said, she's something of a pariah to members of that guild, though it doesn't seem to bother her. Troll-Busters - It's pretty much exactly what it sounds like. This guild exists solely for the purpose of trolling the trolls and sending them packing. More "For the Lulz" that out of any sense of nobility, though. 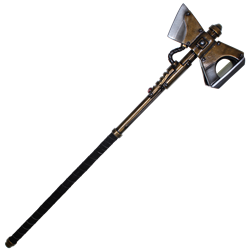 Razorangs & Remote Razorangs - Boomerang-type weapons that can be opened and either thrown or used as high risk, high reward melee weapons (Hooked daggers, basically). The remote variety is good for surveillance and the remote function can be shut off to make them homing-blades. They don't do much damage, but they're fast and remote rangs can strike multiple times. Best used to distraction, chip damage, and Exact Strikes against weak-points on structures and opponents. Gooey Boomers - Essentially sticky bombs. Stick them to something and they go boom, also causing fire-damage, as well as a Burn DOT (Damage Over Time) Effect if the bomb was directly on the target at the time of detonation. There are two variations. The regular timed bomb that goes boom shortly after being activated, and the motion sensor. Shrieking Violets - Little devices that, when activated, take a moment and open up like flowers, unleashing a loud and eardrum busting shriek that does no damage to players, though it can stun them and leave a temporary Disorient Effect, which can last a few seconds. It can, however, do damage to animal summons and any player who does, for whatever reason, have a sound weakness. Hazer Pods - Trapper carries around a few pods that, when activated, emit a cloud of smokescreen which has a 30% change of causing a temporary Poison DOT Effect, reducing HP every two seconds. Icicle Crashers - Trapper carries ice grenades that go boom, dealing ice damage and causing a slight speed reduction if they hit. Should they miss, they'll simply freeze a portion of the field. Resources - Trapper carries a finite amount of the aforementioned items and stocks up on resources so she'll be able to craft more, should she need to in a fight. Trapper has... an interesting history in the games. Back in the original game, she managed to somehow get herself kicked out of the Tech Guild. Ever since then some interesting stories have popped up, making her out to be some kind of madwoman or monster. Several myths have surfaced pertaining to her and what she's apparently capable of [See THIS for what I mean]. Some have been good and, in fact, celebratory. Others... not so much. And then there are those myths that are just plain outlandish and ridiculous... but they're so very entertaining. She's stayed out of the public eye for a while, at least in name. So no one knows what she even looks like, anymore. Her image doesn't appear by her name in the registry, in fact. Trapper couldn't possibly care less about her reputation. She takes great delight in making fun of it and herself, though she doesn't exactly deny that she is deserving of it, either. Sorry if I've been holding you guys up lately; I've been very sick. Again. Yes, I'm also very tired of this happening. I'll have my post up by tomorrow afternoon, evening at the latest. It's fine Eon, as nobody is affecting your characters. Might be easier to put appearances in the discussion. Ah, I should probably post for Lux and Aero as well. Hey, doing some math here. I want to figure out who everyone is eligible with for the tournament. Mainly because I know we have a few planned to go and I dont think everyone realizes what to do yet. We have 11 player characters (not counting my to faerie-to-be) and 8 roleplayers. so 1-3 characters can have npcs. furthermore the two sweepers Sable and Andromeda cannot be paired together. I don't know exactly if M15ery being a blood wizard effects if he can pair up with a mage etc. I can think of a lot of combinations on why two characters should be together, based on guild/personality/fighting style/posting frequencies. So pick your poison. 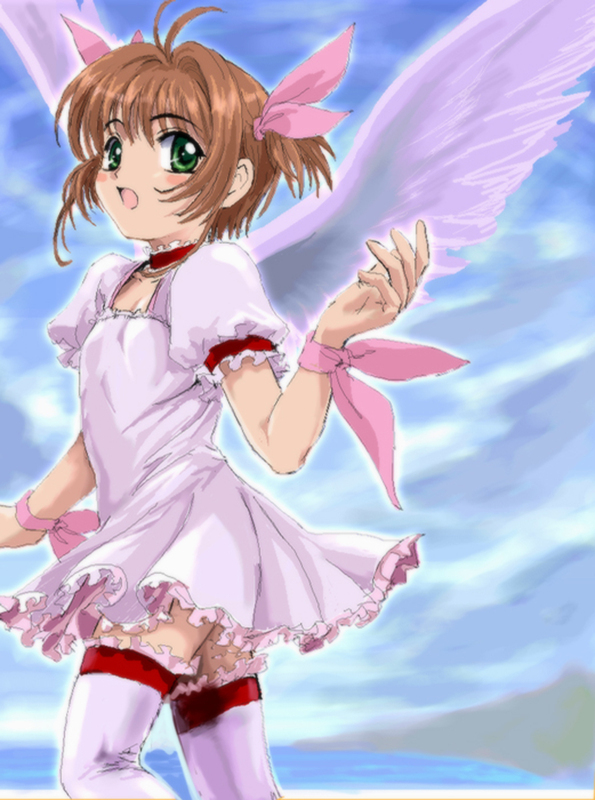 ~Unless someone comes up with a really good reason for otherwise, I'm forcing CanineBlade with NekoLen. I want to see Miss Anti-Social-Snotty-Viper interact with Miss Outgoing-Social-Butterfly. A couple of itty bitty technicalities. Arier and Astrid won't be competing. Also: Trapper is no longer a part of the Tech Guild. She was kicked out. She's not a part of any major Guild. Personality: A very innocent, caring young girl. She wants the best for everyone and is just a typical eight-year-old. Background: She is Lucy's younger sister, and looks up to her sister in every way. She comes from a wealthy family and lives a charmed life. Character Weapon(s): A magic wand used to summon items for her to fight with, as well as weak monsters. Player History: Nekorin is a new player to the game. She is a rare item hunter. However, she didn't really collect the items herself - an unknown player (Nekolen) has been giving these items to her. She doesn't know how to fight properly and plays the game whenever she sees her big sister is playing it. 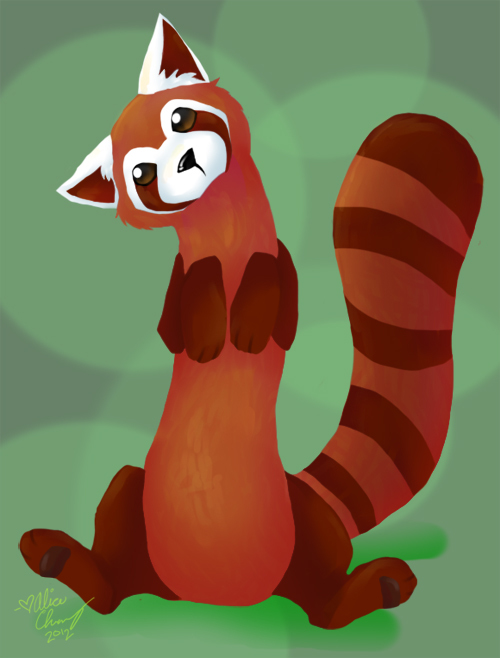 A supporting character acting as Sable's little sis. Personality: Ember is veeery easily bored. Unless she has the opportunity to hit things. Then she’s all smiles. While not exactly a louthmouth, Ember is a scrappy little thing and revels in the opportunity to cut loose. Though she’s quickly bored by a fight she perceives as easy. When she hasn’t stricken a fighting pose, her default position seems to be lax, with her hands behind her head and a disinterested stare. Ember doesn't use weapons. Instead she fights unarmed, specializing in pressure points, disarming, and martial arts, as well as power moves for characters whose armors have high armor ratings. Ember has a long list of special attacks, linked to her martial arts training. However, her most powerful technique is entitled "Mach Speed." A move in which, first and foremost, the weights hit the ground and everyone now realizes how heavy they are. Then comes a series of rapid pressure points, disabling her opponent’s movement. She follows this up with a barrage of punches, kicks, and tackles and ends with one firm punch so powerful it causes a shockwave. Another of her more frequently used attacks is Chi Jab, which is a moved designed to sunder armor. Ember's unique grinding method has made her a particularly unique Acrobat whose physical output is more in line with that of a dread knight or berserker, with unprecedented stat spreads in strength, as well as her speed, the latter of which was already exceptional due to her class. Even with her weights on, she is incredibly quick and agile. Once they're off, the gloves are off. Her speed doubles, making her a living blur. She has a high dexterity and agility, but low constitution and average defense. Shackles of Aerith - An enchanted set of wrist cuffs that are incredibly heavy, to the point of significantly stifling a character's motion, should they not have the strength stat required to use them, cutting strength and speed by 25% while they're being worn. However, while wearing them, extra stat boosts are granted to Strength and Speed upon level up. Waistband of Flemmeth - An enchanted belt that weighs a ton, cutting a player's speed by 25% while worn, though boosting their defense. Also, while wearing it, extra stat boosts are granted to Strength and Speed upon level up. N/A - Barring the standard items (potions, foods, etc), Ember carries nothing, really.